Bay of Plenty is a Fast and Steady Growing Bay in New Zealand! Nature Gives the Bay of Plenty to New Zealand! Bay of Plenty covers 9,500 square kilometres of coastal areas stretching from the Coromandel Peninsula in the west to Cape Runaway in the east. This is a popular holiday destination in New Zealand. In addition to its rich natural cover, people also consider the area the impulse of the rising economy in the island. Development is escalating fast and modernization has touched most of the cities in the bay. Beside the important port of Tauranga, there are some other important towns and cities named by the same name as their districts like Rotorua, Whakatane, Opotiki and Kawerau. The population in those areas ranges between 116,000 and 3,999 people. The following article is about Bay of Plenty in New Zealand. If you have more information about it or about the surrounding areas I have mentioned here, please use the form to write it. I have some useful gifts for you just for doing this. Thanks. When the English explorer Captain James Cook reached New Zealand in 1769, he was impressed by the richness of nature. As he mapped the entire coastline along the way, reaching up to the rich abundance of fruits and crops that were in the Maori villages on the east coast of the North Island, he gave the area its promising name "Bay of Plenty". However, that name which refers to the plenty of fruits in the bay reflects today in the fast development and the growing and prospering economy. Nearly 500 years before Cook arrival to the region, the first Maori people had arrived to New Zealand and landed on Mauao (Mount Maunganui) in central Bay of Plenty, attracted by the area's abundant supplies of food. They named the bay the "sea of Toi" in the Maori language. 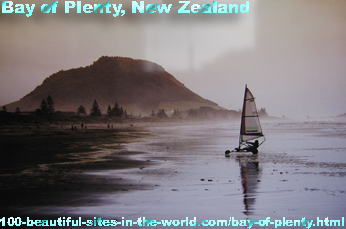 Bay of Plenty becomes nowadays a popular holiday destination in New Zealand. However, there are also some other tourism attractions such as Franz Josef Glacier. The endless white beaches, impressive natural harbours, rugged hills, hot summers and mild winter attract divers, kayak sailors and kite surfers in addition to general holiday tourists throughout the year. At the entrance to the port city of Tauranga, the sacred Mauao Mountain hangs up to 232 metres, shading the mythology of Mauao arrival to the harbour. Later, people named it Mount Maunganui meaning the big mountain. At the edge of the peninsula east of the gulf and in the entrance to Tauranga harbour lies Mount Mauao Reserve and behind it are Mount Maunganui Beachside Holiday Park, the Beach Hut of Mount Maunganui, and Mount Maunganui Information Centre for visitors in Salisbury Avenue. At the south lie many other sandy beaches such as Omanu Beach. As one of the fastest growing and sunny cities in the north island of New Zealand, Tauranga has tripled its size just over the last twenty five years to become the fifth largest area, the largest port in New Zealand and one of the main business centres with all important and modern facilities in business and tourism industry. It is now 168 square kilometres and has 116,000 inhabitants. The beautiful coastline is a popular area and it has sparked extensive buildings in recent years. Across the Bay of Plenty, it has been projected that the population will double or even triple by 2050. The rapidly growing population and the continuing construction on the coast increase the area's vulnerability to erosion. Rising sea levels and higher storm surges are projected to increase erosion and flooding of coastlines in the Bay of Plenty. All this poses a serious risk to homes and infrastructure along the Bay of Plenty. Another effect of global climate change is the projected severe drought that will happen every five to ten years by 2080, which will increase the danger of fire by 10-50 %. Droughts and fires will lead together to the loss of forests and farmland. These events will force farmers to change their crops, posing a severe challenge to the very fertility and prosperity that gave the Bay of Plenty its name. You can either comment on this article about Bay of Plenty in New Zealand or write your own. To do so, please use the following form and contribute to this page. It is good idea to leave your email address so you can receive replies to your comments. PLEASE BE ASSURED, no one of the commentators will capture your email address. It is only that the system that will send you notifications about replies to your comments, as this process is automated. Thanks to SBI 2.0 for making interaction with nice visitors like you possible with the strong website building and optimizing tools, in addition to Web 2,0 tools. I have some gifts for you too for sharing your words about Bay of Plenty in New Zealand and the affects of global warming on that area. Thanks. Search inside Bay of Plenty in New Zealand. You can also enjoy more activities here indeed if you liked this page about Bay of Plenty in New Zealand. Please share it with your services through the buttons here, at the left column of the page and at the bottom of the page. I use "Solo Build It" tools at the bar below to empower this page about Bay of Plenty in New Zealand and the entire 100 Beautiful Sites in the World. Thanks to those strong website building and optimizing tools.